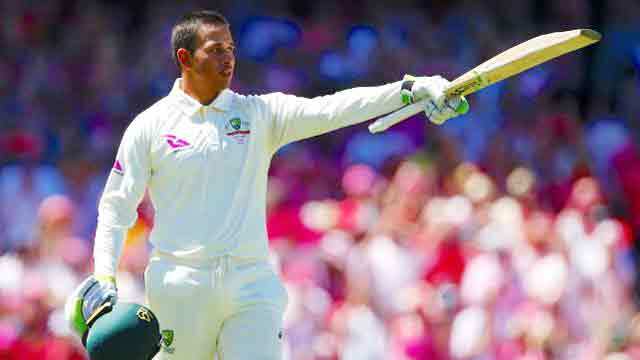 Dhaka, Jan 6 (Just News): Usman Khawaja hit a mammoth 171 and Shaun Marsh was approaching his sixth test century as Australia eased 133 runs ahead of England on 479 for four after the third day of the fifth Ashes clash on Saturday. Khawaja shared a stand of 188 with captain Steve Smith, who was dismissed just before lunch, and another of 101 with Marsh, who just missed out on his second hundred of the series in the over before stumps. Marsh will resume on 98 on day four with his brother Mitchell, who was 63 not out, as they look to bat the tourists out of the match and set up an opportunity for their bowlers to secure a win that would give Australia a 4-0 series triumph. The Marsh brothers combined for 104 in the final session and punished England with a flurry of boundaries in the last hour as the bowlers tired after a long day’s slog in bright sunshine at the Sydney Cricket Ground. It was Khawaja’s sure hand, though, that guided Australia past England’s tally of 346 after Mooen Ali (1-125) had stunned a packed house by moving the apparently unmoveable when he dismissed Smith caught and bowled for 83. “It’s awesome,” Khawaja said of his innings. “The SCG was where I grew up playing cricket for New South Wales and an Ashes century is something I have wanted for a long time and I haven’t been able to achieve, so it was very satisfying. Smith had already scored three centuries, two of them unbeaten and one a double, in the series and although denied a fourth, walked off his home ground having amassed 687 runs at an average of 137.4 over the five tests. Khawaja had an lbw scare in the following over but was reprieved when TV pictures showed Mason Crane had bowled a no ball and he otherwise looked assured as he calmly totted up the runs in the face of some tight English bowling. A fine stroke-player but considered suspect against spin bowling, Khawaja has had a stop-start career in the baggy green since making his debut at the SCG in the corresponding Ashes clash eight years ago.